“Artspiration offers an opportunity to showcase the art work of our talented student artists to the community,” said Rob Richardson, President of SAPSF. Guests will have an opportunity to meet some of the winning artists. “I am very proud to be part of an organization supporting arts in education,” said Kristen Crellin, SAPSF Board Member. 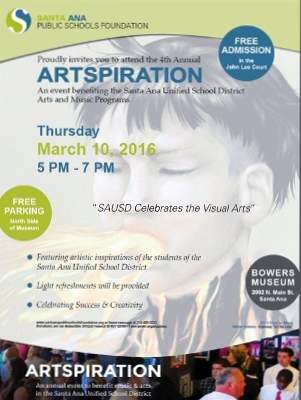 All proceeds raised from this event will support arts education in the Santa Ana Unified School District. “Congratulations to the winners! There is no better way to express one’s feeling than through art,” said Bruce Hamlin, Owner of Guaranty Chevrolet and SAPSF Board Member. Admission and parking is free. If you are interested in covering this event, please contact Deidra Powell, Chief Communications Officer of the Santa Ana Unified School District, at (714) 673-4995 or deidra.powell@sausd.us.